36% will shame you publicly, 1 in 3 will switch to a competitor. 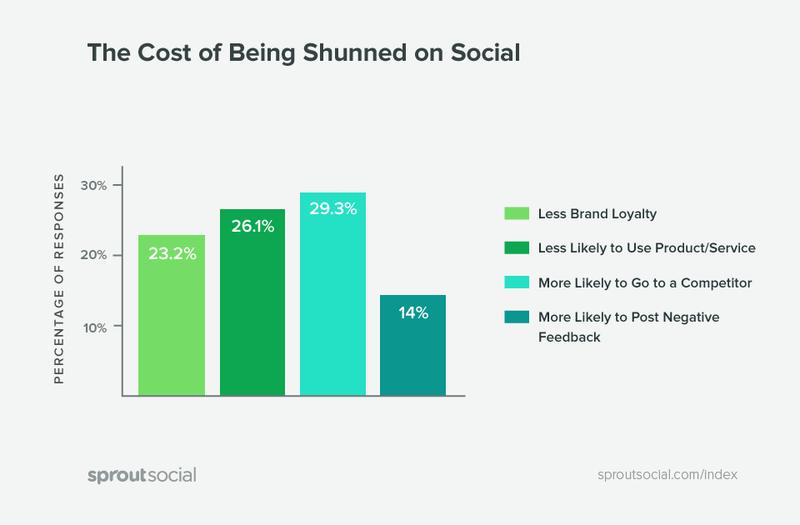 For years, Sprout Social has been touting the benefits of social media engagement for brands’ bottom lines. Unfortunately, most businesses continue to use social as a promotional mechanism instead of a two-way communication channel. Case in point: Brands send 23 messages for every 1 consumer response. So we decided to take a deeper dive into the data to understand the disconnect between customer expectations and brand realities and what role that gap plays in loyalty, customer retention and publicity. 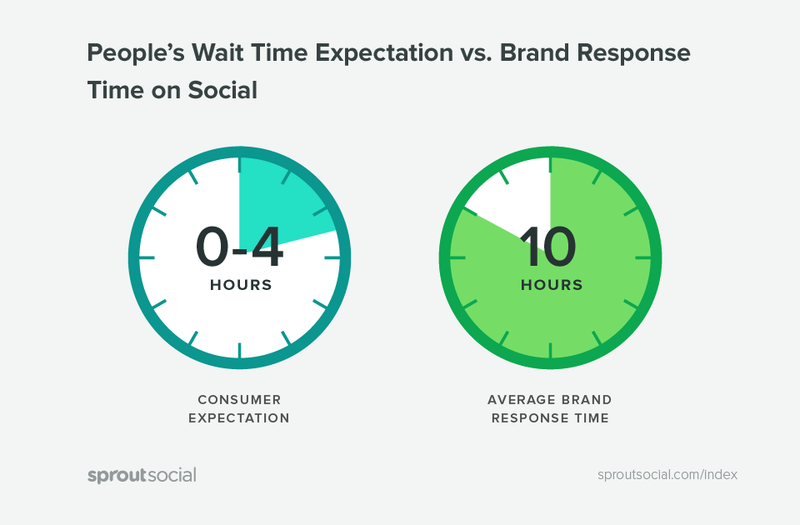 For this report, Sprout surveyed more than a thousand Facebook, Twitter and Instagram users on their expectations for reaching out to brands on social. We then compared their responses with data from the social profiles of thousands upon thousands of brands across 15 industries in all. From Sprout’s ongoing brand index and new consumer survey, here’s what we found: The average person sees social media much differently than the average brand. While brands view Facebook, Twitter and Instagram as broadcast outlets for pumping out promotional content, consumers recognize these social channels for what they truly are: powerful portals for two-way dialogue. In fact, 90% of people surveyed have used social in some way to communicate directly with a brand. 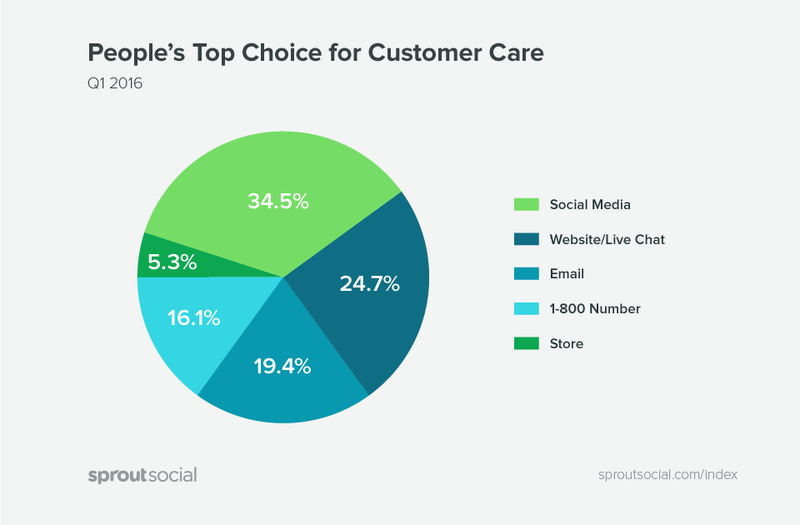 What’s more, social surpasses phone and email as the first place most people turn when they have a problem or issue with a product or service, according to Sprout’s consumer survey. 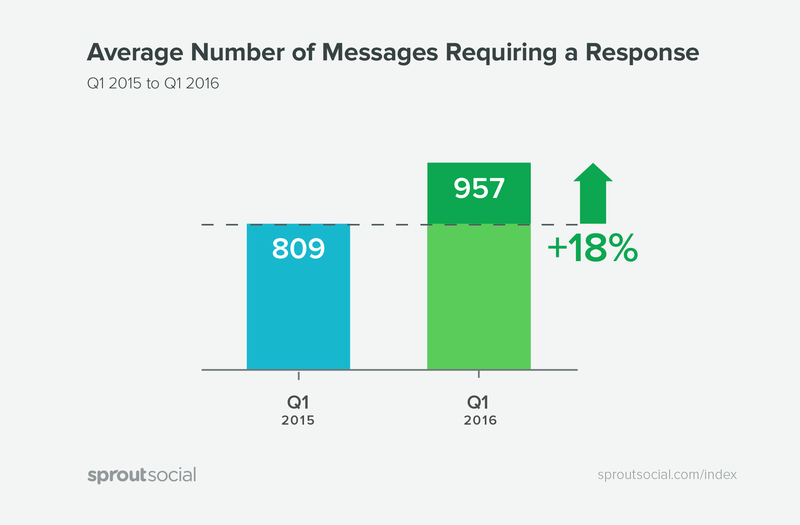 Following this trend, The Sprout Index shows that the number of social messages needing a response from a brand has increased by 18% over the past year. In spite of the high volume of messages that require a response, brands reply to just 11% of people (a number that’s been stuck in neutral since 2015). What do brands prefer instead? Promotions! After all, who doesn’t want to visit a Facebook Page bombarded with coupon codes and unanswered inquiries when they’re having trouble at the airport or need to know if a wedding gift will arrive on time—right? Of course, promotions play an important role in a brand’s overall communications strategy, but the balance on social is way off. 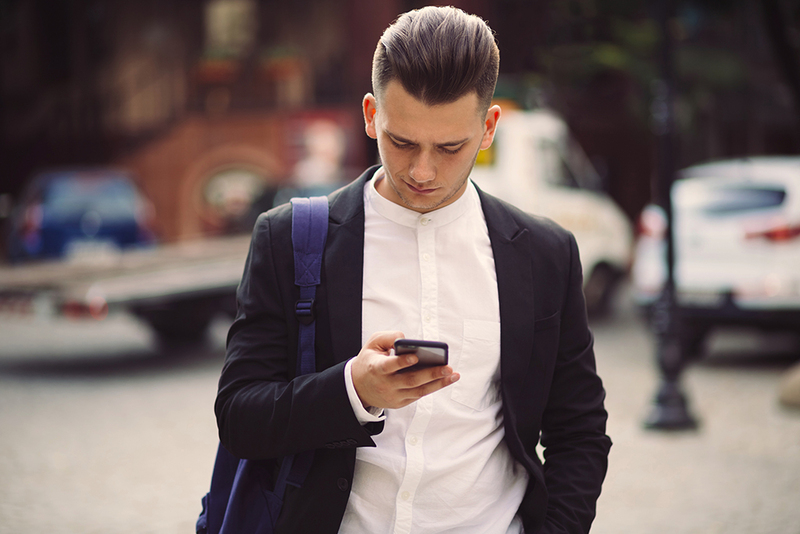 Brands send 23 promotional messages for every 1 response given to their audience. That’s by far the worst ratio we have seen in the past three years since we began tracking brand engagement efforts (or lack thereof). It’s also resulted in 10% more brand messages on social from a year ago. It gets worse. When brands respond—if they respond—they let people hang for an average of 10 hours, even though most people consider under 4 hours reasonable. People aren’t asking for the world. They would simply like to hear back when they reach out to your brand. If your responses lag for a bit, that’s totally reasonable in the eyes of most people—but within an acceptable range of under 4 hours. After that, most people are out; in fact, they may even switch to a competitor. Brands need to rethink their social strategies and staff up accordingly. Social is a shared effort that should be tackled by all the parts of your organization that have some skin in the game—from sales to HR. The payoff of positioning yourself as a truly social business can be staggering, from its effect on retention to referrals to R&D. Social media is a highway. 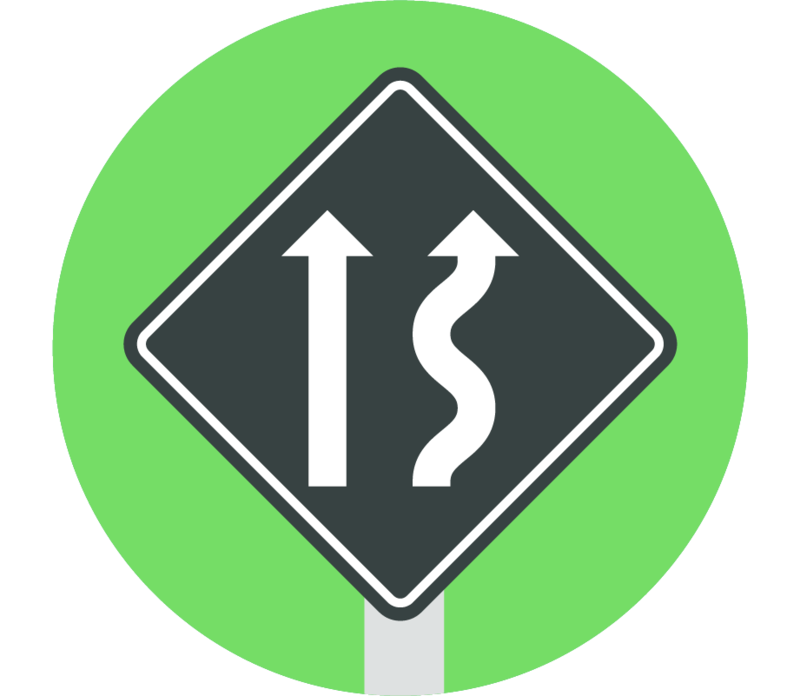 People move in many directions with varying degrees of urgency. 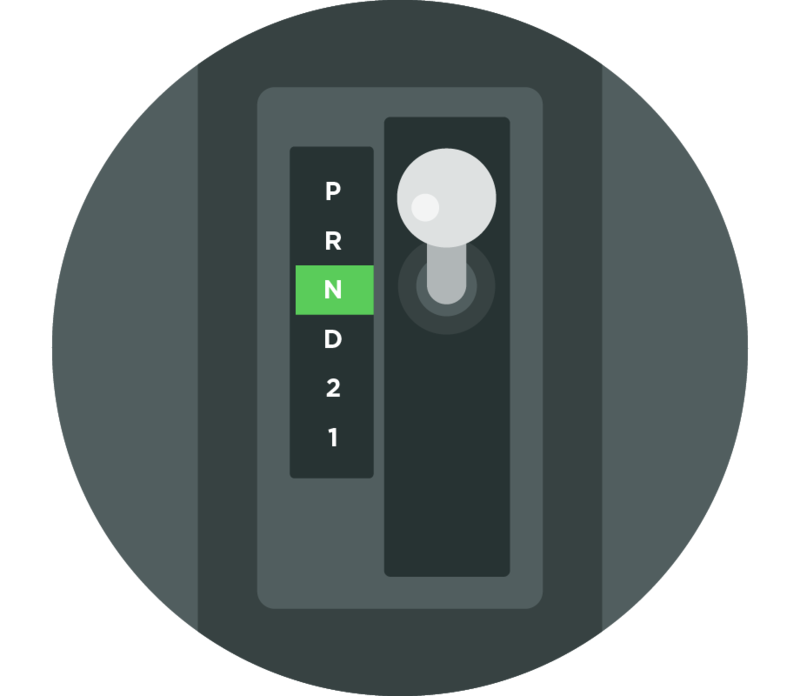 Signals therefore play a critical role in helping drivers get to where they’re going. Unfortunately, most brands ignore the rules of the road—often moving in the wrong direction at the wrong time. 30% of people will go to competitor if a brand doesn’t respond. 25% of people are less likely to go to a competitor. 25% of people are less likely to post negative things about the brand, product or service. Promotions obviously play a critical role in the sales strategy of your organization. But there’s a much more effective way to build your brand on social over time. First, give people what they want: helpful answers to their questions about your product, service or brand. By listening and prioritizing customer care, you can even convert people into highly vocal brand advocates. In fact, 75% of people say they are more likely to post something positive about a brand that makes a meaningful connection with them on social, while 70% say they’re more likely to actually make a purchase. People expect the most interaction and information from consumer services/goods in the form of responses, promotional materials and relevant industry news. The good news: This gives the industry the most room to play. 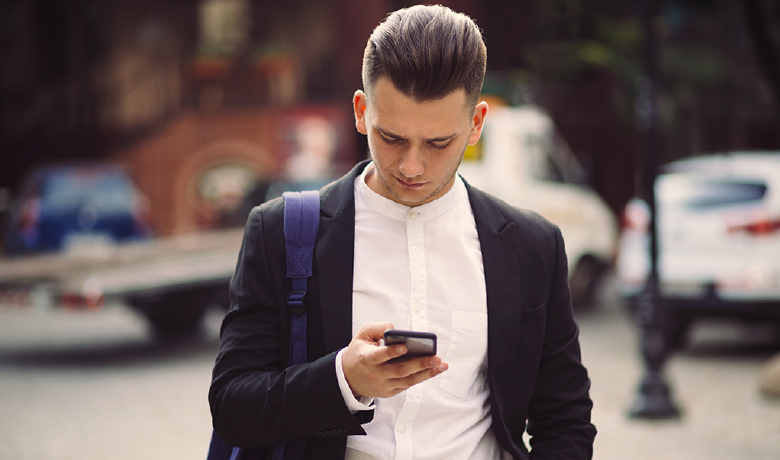 The bad news: The industry responds to just 12.9% of its messages. Posts per replies from media and entertainment (the focus of last quarter’s Index) shot up 421%, from 8.7 to 45.3. Is Tinseltown growing even more vain? 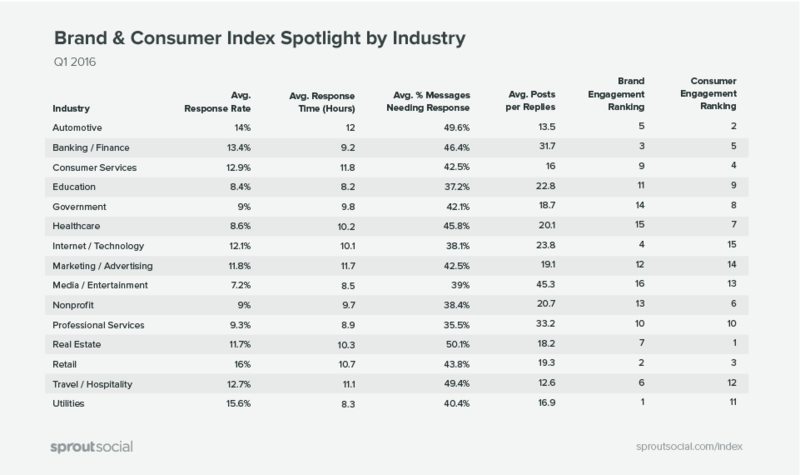 Utilities and retailers have maintained their top brand engagement spots, at 1 and 2, respectively, for the past three quarters. Of course, there’s room for improvement in both industries, but they should be proud of the strides they’ve made thus far. Across every brand, on virtually every metric that matters, little has changed from the previous quarter. People are clamoring for greater social engagement—with both their mouths and pocketbooks open—but brands are not moving fast enough. Brands need to ask themselves: Why are we not responding? Is it bandwidth? Time? Or are we unequipped to handle the types of messages we’re receiving? Outline a plan for tackling the onslaught. Also, be sure to speak with a unified voice that still empowers each agent to show some personality. Any way you slice it, the opportunity is ripe for wise brands to step forward and clean their competitors’ clocks. How? Through the simple gesture of an actual human response. 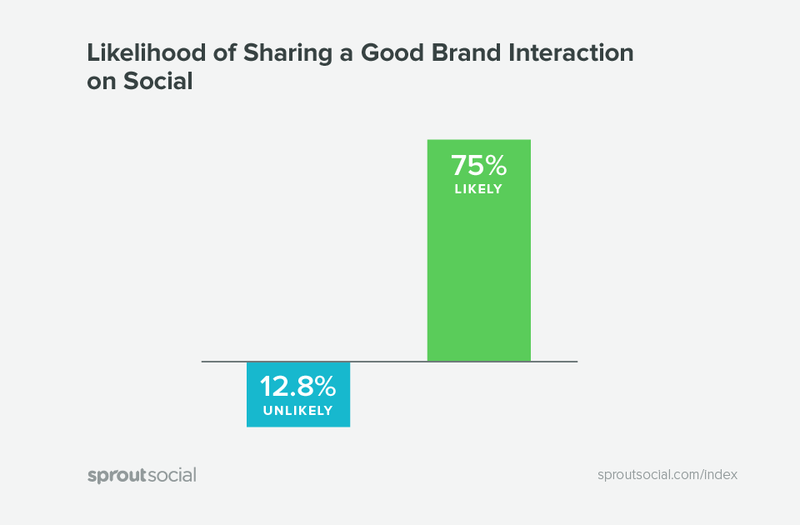 The Sprout Social Index is a report compiled and released by Sprout Social. All referenced data is based on 247,000 public social profiles (93,000 Facebook; 114,000 Twitter; 40,000 Instagram) of continually active accounts between Q1 2015 and Q1 2016. More than 2.9 billion messages sent and received during that time were analyzed for the purposes of this report. Some data may have shifted from the last Sprout Social Index report due to a shift in the social profiles analyzed; however, all overarching trends remain consistent. Industry classifications were based on LinkedIn industry categories. In some cases, closely related industries were merged into a single overarching industry. All messages analyzed that were considered casual mentions or not in need of a response were excluded from engagement, response rate and response time calculations with the intention of eliminating noise. Analysis of which messages required attention was done using Sprout’s proprietary technologies. Response time and response rate calculations were done using Sprout’s Engagement Reporting technology found in the Sprout Social product. This consumer survey was conducted by Survata, an independent research firm in San Francisco. Survata interviewed 1,062 online respondents between April 08, 2016, and April 11, 2016. For further information, visit www.survata.com. 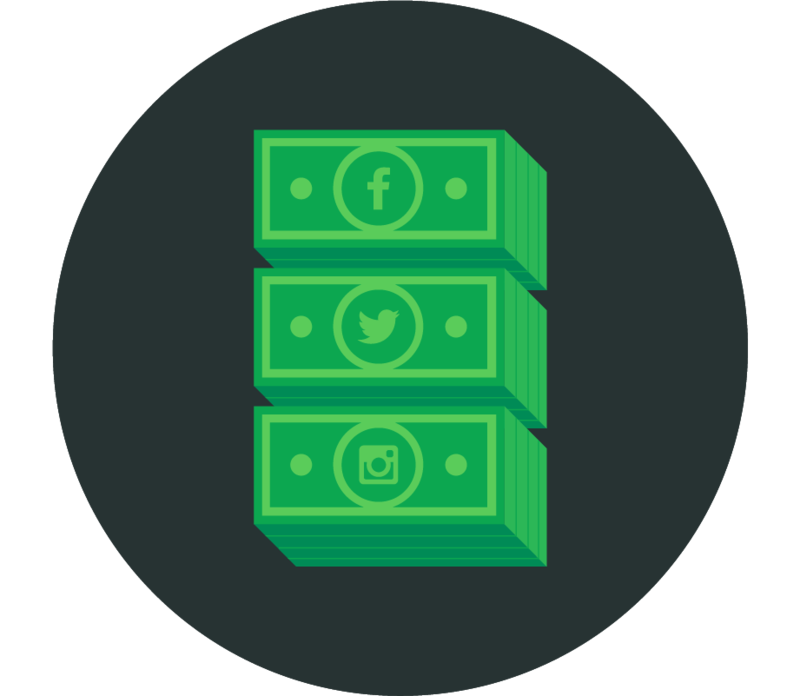 For questions about the Index data, please contact: pr@sproutsocial.com.